Spring is full of possibilities and opportunities for fun and learning. Gardening, one of our favorite springtime activities, provides a real life hands on way to learn about how plants grow in the spring and throughout the summer. 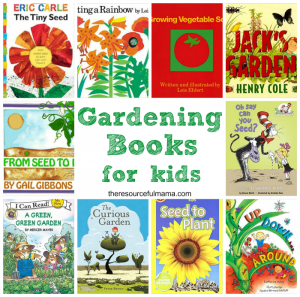 Gardening books for kids are a great tool to aid in this learning. These gardening books are beautifully illustrated and really useful in teaching kids about seeds, plants, and the growing process. Whether you are growing a flower garden or vegetable garden, kids will find them fun, engaging, and informative. The Tiny Seed by Eric Carle is a great story about the life cycle of a seed. We did fun and educational activity in conjunction with this book. See it here. Planting a Rainbow by Lois Elhert is great book about how bulbs, seeds, and seedlings grow into beautiful, colorful flowers. Growing Vegetable Soup by Lois Elhert Bold illustrates the growing process from seed to cooking pot. Jack’s Garden by Henry Cole takes you through the gardening process, labeling stuff you would find and use in a garden. From Seed to Plant by Gail Gibbons shows the relationship between seeds and plants. Oh Say Can You Seed? : All About Flowering Plants by Bonnie Worth brings us the The Cat in the Hat along with Things 1 & 2 to teach us about the growth, function, and parts of plants. The Curious Garden by Peter Brown has a simple message of caring for the environment and how little things have big impact. National Geographic Readers: Seed to Plant by Kristin Baird Rattini is an informative book about how plants grow. Little Critter: A Green, Green Garden by Mercer Mayer is about Litter Critter and his family planting a garden and after lots of watering, weeding, and waiting they finally enjoy a delicious meal from the garden. Up, Down, and Around by Katherine Ayres & Nadine Bernard Westcott is a fun rhyming gardening book that teaches kids prepositions. My kids love The Curious Garden. We will have to check out a few of these other ones!